In 1981, while working in drama, Fox decided to retrain in literacy studies. She said: "Literacy has become the great focus of my life – it's my passion, my battle and my mission and my exhaustion." She has published books on literacy aimed at children, their parents, teachers and educators. She held the position of Associate Professor, Literacy Studies, in the School of Education at Flinders University until her retirement in 1996. Since her retirement from teaching, Fox travels around the world visiting many countries and doing presentations and speaking on children's books and literacy issues. Following an aggressive interrogation by US immigration officials on a trip in February 2017 to deliver a keynote speech in Milwaukee, Fox said that she would probably never visit the US again. Fox wrote her first draft for the internationally acclaimed Possum Magic in 1978 during a course in children's literature at Flinders University. Nine publishers rejected the draft over a five-year period. When it was accepted by Omnibus Books in Adelaide they asked Fox to reduce the 4½ page book, then entitled Hush the Invisible Mouse, by two-thirds and to change the mice to Australian animals to place emphasis on her Australian theme. Possum Magic is now one of the most recognised picture books in Australia and has sold over 3 million copies worldwide. The two main characters in Possum Magic are Grandma Poss and Hush. Hush has been made invisible by her Grandma to protect her from the dangers of the Australian bush. The story details the duo's adventures as they tour Australia searching for the secret to Hush's visibility. It is a rhythmical story of Australia's varied landscapes and the animals that live in them. The book Guess What? ranks number 66 on the American list of the 100 most challenged books 1990 to 2000. Groups and agencies can challenge a book to prevent it from being available to be read by the general public. Fox was born Merrion Frances Partridge in Melbourne, Australia, but grew up in Southern Rhodesia. Her parents were missionaries and she attended Hope Fountain mission school, near Bulawayo. When she was eighteen, she went to England where she was accepted into an English Drama school. In 1969, she married Malcolm Fox, a teacher. The following year they returned to Australia and in 1971 she gave birth to her only child Chloë Fox, a former ALP member of the South Australian Parliament. She dislikes her given name, and adopted the shortened form "Mem" at around the age of 13. She has never taken the step of legally changing her name, and so remains "Merrion" for official purposes. Fox attracted controversy in 2008 after claiming entrusting very young children to childcare is child abuse. Her comments were generally supported by the Australian Family Association based on research on the importance of time with and attention from parents, though they did describe Fox's comments as "perhaps a little bit unfair". Parent groups like Career Mums described Fox's comments as "irresponsible" as they didn't take into account the quality of care received by children, the social and cognitive development which goes with exposure to professional early childhood educators, and the economic pressures that can force parents to return to work. Honorary doctorates – Wollongong and Flinders Universities, Australia in 1996 and 2004. ^ a b c d e f g "Life Story". Mem Fox website. Archived from the original on 2 March 2008. Retrieved 7 March 2008. ^ Benns, Matthew (24 April 2005). "Brown's secret society set to crack million members". The Sun-Herald. Retrieved 25 February 2017. ^ "The 100 Most Frequently Challenged Books of 1990–2000". American Library Association. Archived from the original on 18 February 2008. Retrieved 7 March 2008. ^ Sharron L. McElmeel (1992). Bookpeople: A Multicultural Album. Teacher Ideas Press. p. 55. ISBN 0-87287-953-4. ^ Interview by Maria Zijlstra (22 August 2009). "The power of names". Lingua Franca. Radio National. 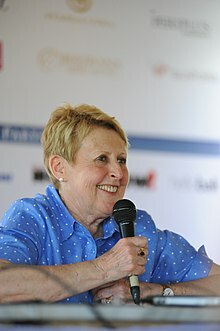 ^ "Childcare for babies is 'abuse', says author Mem Fox". Sunday Mail (Queensland). 31 August 2008. Archived from the original on 30 August 2012. Retrieved 11 July 2011. ^ "Dromkeen Medal". Scholastic. Archived from the original on 3 July 2007. Retrieved 15 July 2007. ^ "Its and Honour – 26 January 1993". Australian Government. Retrieved 7 March 2008. ^ "It's an Honour – 1 January 2001". Australian Government. Retrieved 7 March 2008. ^ Hartgerink, Nick. "Honoris Causa: for the sake of honour". University of Wollongong. Retrieved 19 May 2018. ^ "Ducks Away!". worldcat.org. OCLC. Retrieved 1 March 2017.